Choose Lists→ Customer & Vendor Profile Lists → Vehicle List. QuickBooks displays the Vehicle List window. Initially, because you haven’t yet added any vehicles, the list shows no assets. Click the Vehicle button (bottom-left corner) and choose New from the menu that QuickBooks displays. 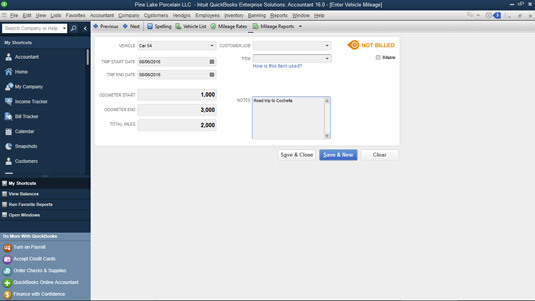 QuickBooks displays the New Vehicle window. Enter a name for the vehicle in the Vehicle text box and enter a description of the vehicle in the Description text box. Identify the vehicle by its make and maybe the year of manufacture. If you have a fleet of cars or trucks, you may want to provide more identifying information than this. Save the vehicle description by clicking OK. Choose Company → Enter Vehicle Mileage. The Enter Vehicle Mileage window. 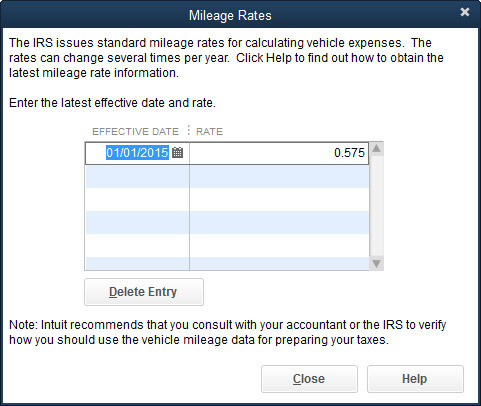 QuickBooks displays the Enter Vehicle Mileage window. Select the vehicle in which you took the trip from the Vehicle drop-down list. Provide the starting and ending dates of the trip. Enter the starting date of the trip in the Trip Start Date field and the ending date of the trip in the Trip End Date field. Note that you can click the little calendar button at the right end of these two text boxes to display the QuickBooks pop-up calendar. Enter the starting mileage of the odometer into the Odometer Start field and the ending mileage of the odometer into the Odometer End field. 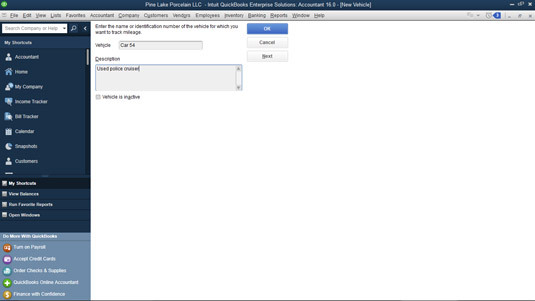 After you enter the two mileage readings, QuickBooks calculates the total trip miles. (Optional) Identify the customer and job. If the trip’s miles should be billed to or associated with a particular customer or job, select the customer or job from the Customer:Job drop-down list. (Optional) Associate the trip miles with a particular invoice item. If you bill the trip miles on an item, select the invoice item that should be used from the Item drop-down list. Provide additional information as necessary. Use the Notes text box to collect or store any additional information needed for the vehicle mileage record keeping. Save the trip information by clicking the Save & Close button. If you click the Reports button at the bottom of the Vehicle List window, QuickBooks displays a menu that lists four different vehicle mileage reports: Mileage by Vehicle Summary, Mileage by Vehicle Detail, Mileage by Job Summary, and Mileage by Job Detail. You can access another menu of commands that produce these same reports by clicking the Mileage Reports button that appears at the top of the Enter Vehicle Mileage window. To produce a particular vehicle mileage report, choose one of the reports from either of these menus. If you click the Mileage Rates button at the top of the Enter Vehicle Mileage window, QuickBooks displays the Mileage Rates dialog box. The Mileage Rates dialog box lists Internal Revenue Service (IRS) mileage rates and their effective dates. You can enter a new mileage rate by clicking the next open row of the mileage rate schedule and then entering the effective date into the Effective Date column and the standard rate into the Rate column. You can find the current year’s business mileage rate at the IRS website. The Mileage Rates dialog box. In 2015, the standard mileage rate equaled $.575 a mile, but the IRS usually updates this figure once and sometimes twice a year. So you want to check for the rate that’s current when you do your calculations. Don’t, in other words, use one of the old, out-of-date standard mileage rates shown here. Please.